While being a pet groomer can be very rewarding and potentially lucrative, this is the hands-down most challenging profession within the pet industry, especially in that this field presents the greatest potential for injuries and accidents—to pets and groomers themselves. 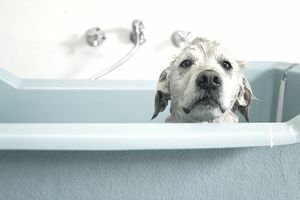 Not only do groomers often find themselves servicing squirmy, frightened, uncooperative or even downright aggressive pets, those in this profession as a rule work with sharp objects, cumbersome grooming tables, heated dryers, water, and other potentially hazardous objects and safety issues. Even the most experienced, skilled, responsible pet groomers are not immune from the periodic accident, often through no real fault of their own. As the old adage goes, "An ounce of prevention is worth a pound of cure." So below are some very important tips for preventing pet grooming accidents. In the recent past, there have been quite a few horror stories related to this profession. In 2012, two customers that took their dogs to a Petco in Hawaii sued the store after their pets were allegedly injured. There have also been reports of unattended dogs being hanged by grooming loops when they accidentally fell from or attempted to jump off of grooming tables, dogs succumbing to heat exhaustion after being left under too-hot dryers, and dogs being attacked and severely injured or even killed by other dog customers. Chuck Simons, the inventor of the Groomer's Helper pet grooming restraint, recounted an incident at an unnamed salon during which a dog jumped from a table when he saw his owner outside the salon, crashed through a plate glass window and caused a car accident, resulting in $1 million in total damages! These may be extreme, rare examples of the kinds of accidents that can happen in pet grooming salons. But this illustrates how important it is for groomers to stay on their toes and be prepared for anything. Make sure that the equipment you use ensures maximum safety for the pets, your employees and you. In addition, one needs to handle puppies, older dogs, and overweight pets with particular care. The aforementioned Groomer's Helper is an excellent device in that it keeps pets from spinning, getting tangled in the loop, leaping and/or falling from tables and biting. Be careful when clipping or shaving pets that have extremely matted coats. As the mats may be very close to the skin surface, this presents a greater potential for cuts and nicks. So, if possible, draw the mat away from the skin with a comb before clipping. If this is not possible, consider shaving the pet. Be mindful of wet floors and dry them immediately to prevent slips and falls. This also goes for any areas where customers may be present. As such, be sure to clean up after any pet accidents in your waiting areas, make sure that dogs are separated to prevent fights, and always keep dogs secured on a leash when leading them through the salon. There are certain aromatherapy shampoos and grooming products that actually have a calming effect on pets. Last but not least, patience and gentleness really are great virtues in this profession. Always remain calm and speak to the pets in a soft, soothing voice and handle them with lots of TLC. Advanced preparation and always anticipating a worst-case scenario are crucial, which is why it is so important to have right liability insurance. When shopping for policies, bear in mind the possibility of accidents and injuries, to your clients and employees. You should immediately point out any injuries to the pets' parents, apologize and offer to pay any vet bills that may result due to the injury. You then may want to offer the client a free grooming session. Another factor that is very important to consider is hiring the right staff as a preventative measure. Although certification and formal training are currently not required to be a pet groomer if at all possible it's best to hire people who have received this. It's also very important to determine if your employees actually love animals, which is one trait that a lot of grooming business proprietors might overlook during the hiring process. It's easy to merely assume that anyone in this profession loves pets. Sorry to say, there are people who get into this pet services industry simply because it's in demand and they merely regard this as a way to make a buck, not because they genuinely love animals. Those who do really love animals are more likely to work well with them and be more cautious. There may be occasions when one of your four-legged clients is so out of control and even downright dangerous, to others and themselves, that there's just no dealing with them. That’s when it may be time to part ways. Ultimately, maintaining such clients is just not worth the effort and stress, for you or the pet. So politely inform the client that you feel it's in the best interest of the pet to cease being serviced by you. Ultimately, pet groomers who follow these guidelines and are always prepared for the worst-case scenarios can minimize potentially tragic accidents and injuries to pets, your human clients, your employees and yourself.